In order to further establish the standard for World Memory Sports development as it has endeavoured to do since 1991 and boost the enthusiasm for memory sports worldwide, World Memory Sports Council has launched the WMSC Certification System. The Ratification / Awards Committee of the World Memory Sports Council, which numbers amongst its members major world leaders and mind sports champions in key areas of brain fitness. 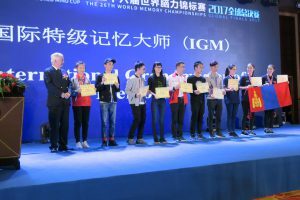 The founders of the World Memory Championships in 1991 head the committee and will be the co-signatories for all certificates. In addition to the existing certificates for the top players such as IMM, GMM and IGM, we will also now release certification for other memory sports players who have achieved the required level in their memory skills. We will, therefore, provide an official evaluation standard for their memory skills levels as well as a reward for their endeavour. An official achievement certificate will be available, to test or competition organizers in an authorized WMSC Memory Club, to give to competitors after the event to recognize their achievement. Of necessity, these certificates can only be produced by WMSC via Regional Memory Sports Councils and issued by the authorized WMSC Memory Club worldwide using registered Arbiters. In order to ensure that certification is valid and genuine, all WMSC Certifications (LMM, LAM & LIM) will be numbered and only be valid if they are listed publicly on the new WMSC Memory Club Web site. Certificates will not only be numbered and personally signed by two of the WMSC senior officers, one of whom can be regional president, they will be stamped with the Seal of the WMSC to ensure authenticity and listed on the official website.